the nOATbook: Why core strength is important for your child and fun ways to improve it. You may have seen the great article circulating around titled 'The REAL reason why children fidget' written by Angela over at Balanced and Barefoot. A teacher friend shared the article and it piqued my interest for two reasons. Firstly because I am a teacher so I can relate. Secondly, I used to be a practising paediatric physiotherapist so I can relate! And I have to agree. Children need to move and they need to move a lot! Strength and balance comes from the repetition you get from playing for extended periods of time. Time spent gaming, using computers or watching TV is time taken away from these important pursuits. Did you know that Australian guidelines recommend that children don’t have more than 2 hours of screen time per day (excluding school activities)? While undertaking specific core exercises will never compensate for lack of time spent riding, climbing, or jumping on a trampoline, sometimes kids do need a little extra help to get back on track. Once they improve their core strength ‘playing’ becomes easier and more enjoyable. In turn their gross motor skills improve and motivation to play also increases. 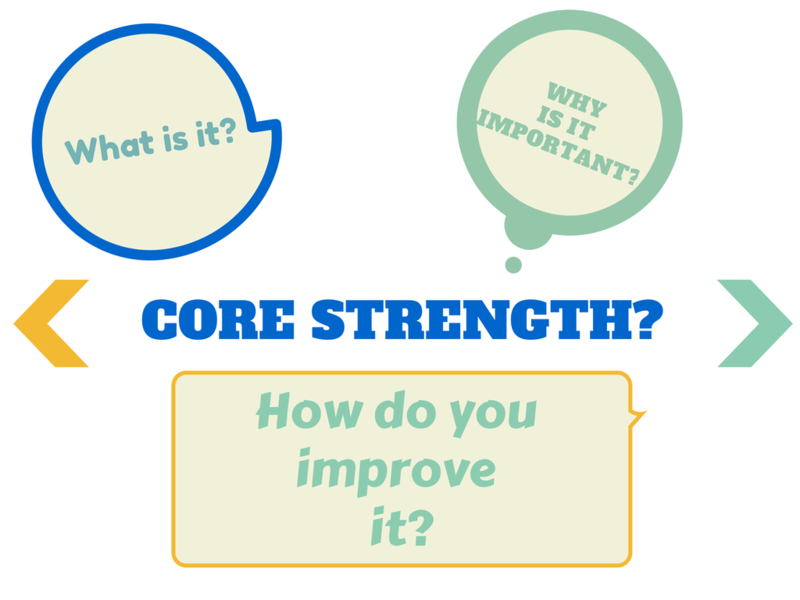 This post will focus on what I would tell parents if they came to see me with concerns about their child’s core strength. Core strength, or postural control, is “both the anchor and launching pad” for everything that we do. It should provide a stable base from which we can move our arms and head and legs effectively. The core plays a role in almost all activities; from sitting to standing, walking to running, the core muscles are always at work stabilising. The body’s “core” refers to the muscles around the abdomen, pelvis, and back. When properly switched on, they act like a muscular corset. 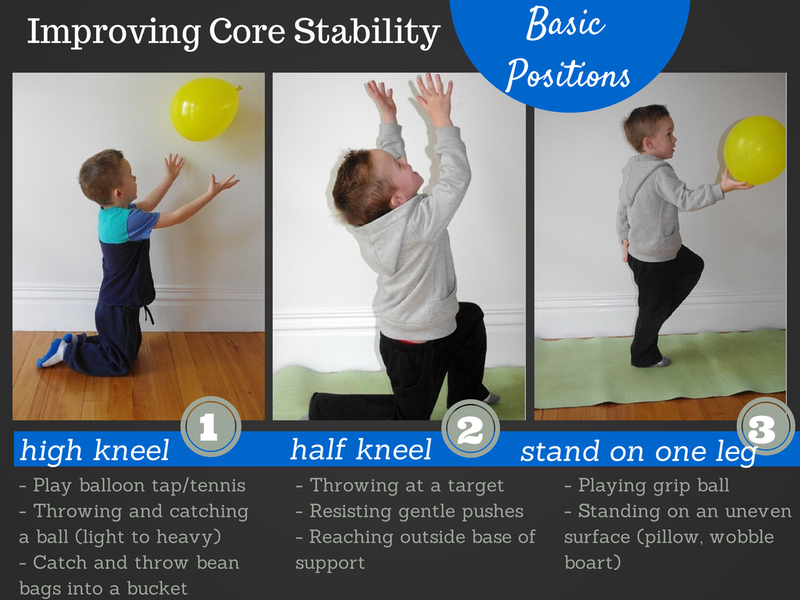 If a child has poor core strength, they will have an unstable base, and it will be more difficult to control fine motor skills, such as writing, or develop a wide range of gross motor skills. I often compare it to trying to move with a spaghetti strand for a trunk – very hard work! 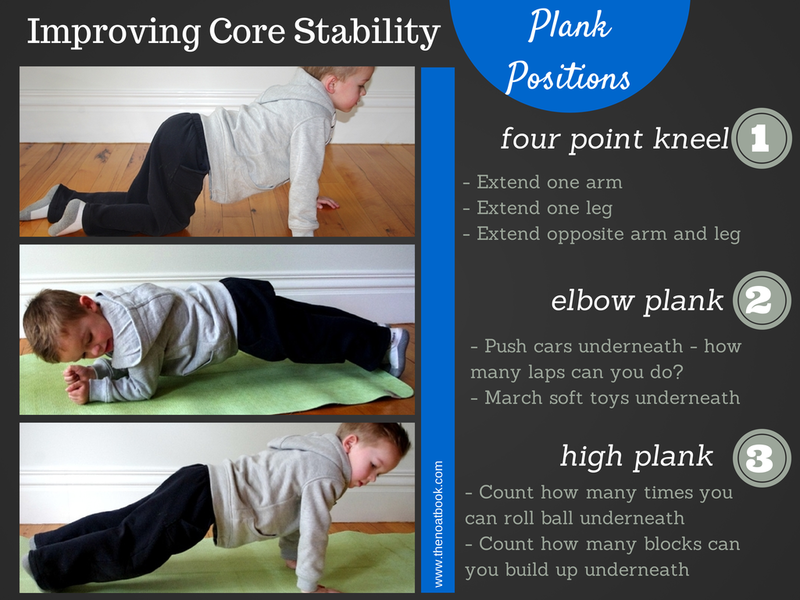 Core strength is also important as it helps prevent injuries related to poor posture and decreases the risk of injury for children playing sport. 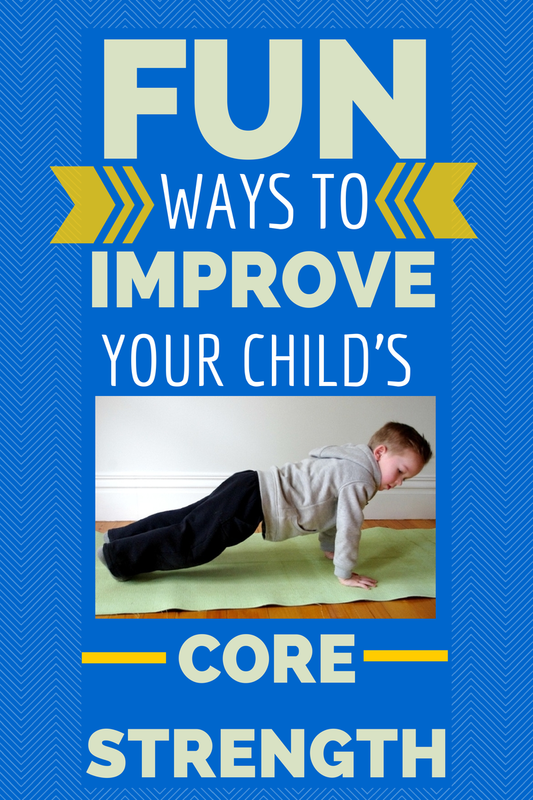 How do I know if my child has poor core strength? 1. Does your child take up the support of all available surfaces? Do they lean against a wall when standing up? Hold their head up in their hands when sitting at the table? Or completely collapse into any chair so every part of their body is supported? 2. Is your child always tired? Do they fatigue more easily, require more rests or appear more tired at the end of the day compared to other children? 3. Do they display poor posture? Rounded shoulders and chin poking out? 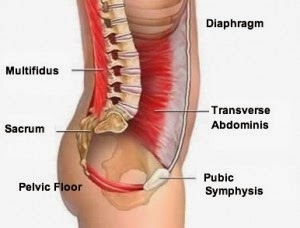 Rounded lower back, eyes looking to the ground when standing? 4. Can they hold a plank position? Traditionally, abdominal core strength is tested using a sit up test but a timed ‘plank’ can provide a more functional test. Data from the 2012 US National Health and Nutrition Examination Survey, National Youth Fitness Survey found, on average, that boys and girls aged 6-11 years old could hold a plank for 60 seconds. It increased to 80 seconds for girls aged11- 16, and 90 seconds for boys aged 11-16. 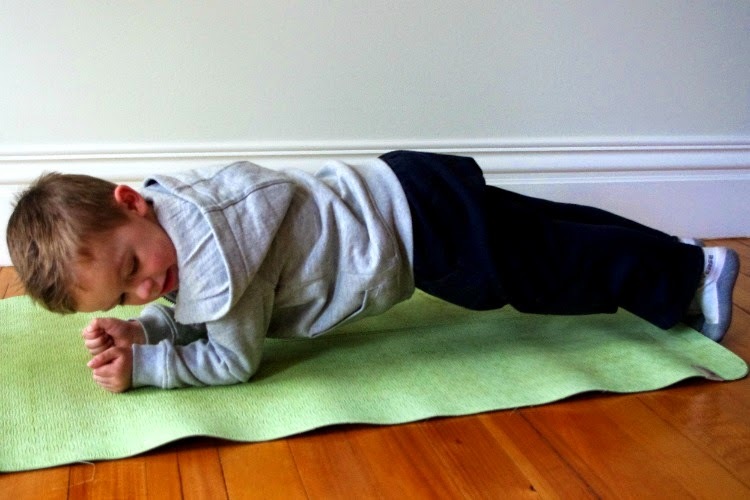 An Australian study found Grade 1 students were able to hold a plank for 30 seconds before undertaking core training and 34 seconds post core training. 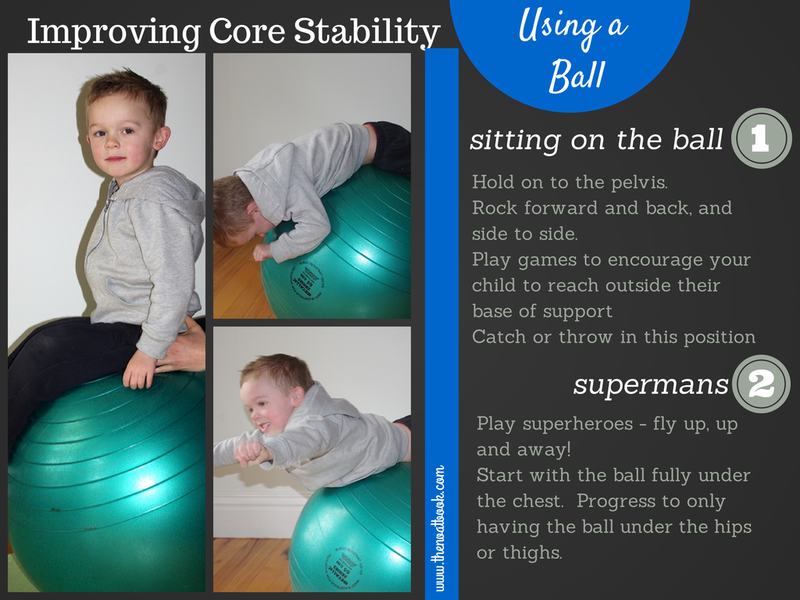 What can I do to help improve my child’s core strength? You can help your child complete a quick 10-15 minutes core strength session, preferably at least 3 times per week. Try to resist taking the drill sergeant approach and instead aim to make it fun. Present it as ‘playing a game’, as ‘learning new tricks’ or as 'a fun competition' depending on your child’s age and interests. Don’t push your child too hard. Limiting the time spent on any one activity to your child's age in minutes can be a useful guide. 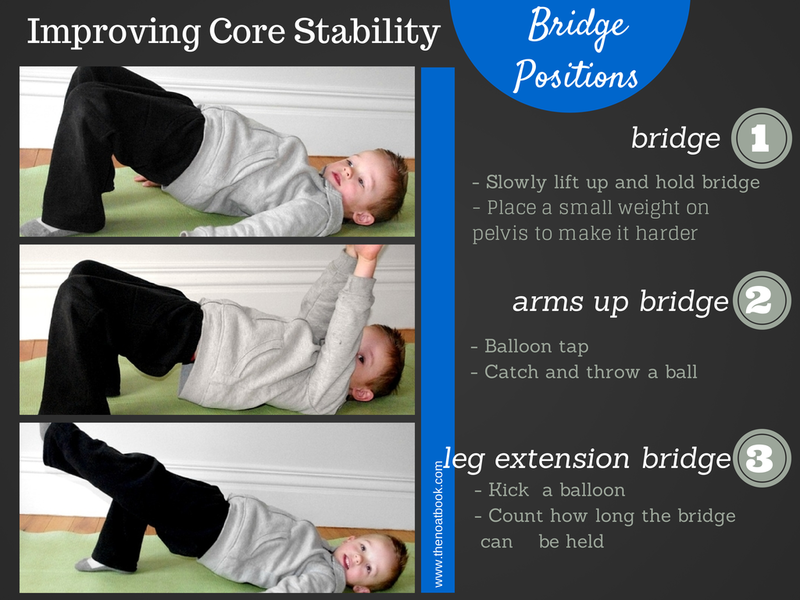 All of these activities can be made harder by placing a small weight on your child's pelvis. Play musical statues or What’s the time Mr Wolf? 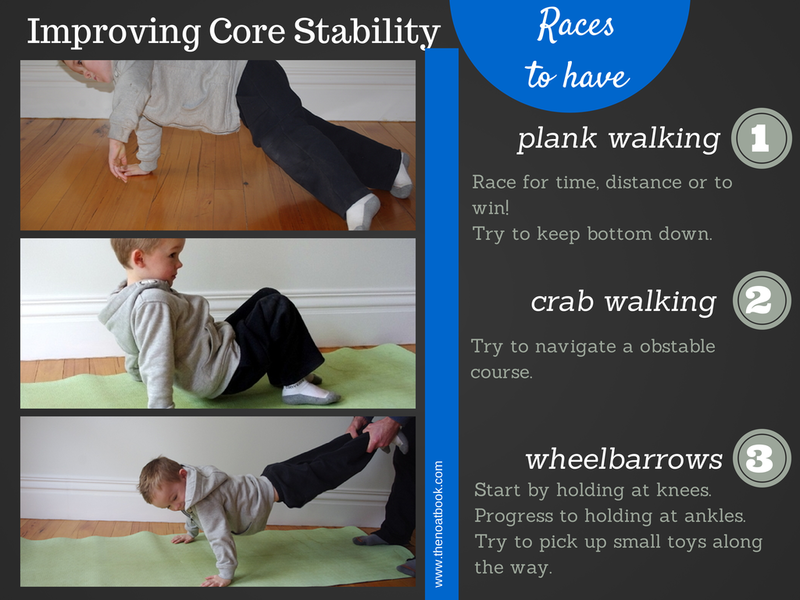 I hope this gives you some ideas and inspiration to improve your child's core strength. Please remember that this is general advice only. If you have specific concerns please seek the advice of a registered health care provider. Luckily for most kids with normal core strength these will just be fun games to play with Mum or Dad! I'm happy to hear you found it educational. I love your little model. Super cute :) That's a crazy statistic. 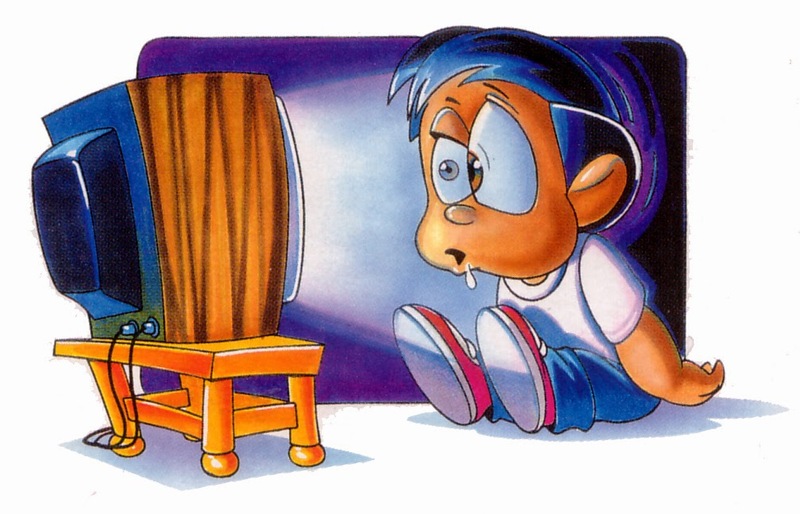 I'd never really thought about it before, but I guess if children are stuck inside in front of the tv or pc then I guess they may lose that core strength. I'm happy to say I doubt my girls have any trouble in that area. They both run around like absolute lunatics. Thanks for sharing the info and I will keep it in mind for the future. Visiting via #teamIBOT. Great post, I am going to try some of these with our Miss 7. We've recently learned that she has some congenital issues with her lower spine so working on her core strength has to be a good thing right?! I did read that post about Miss 7, she really doesn't need another thing to worry about! Improving core strength can never be a bad thing and these activities are all very safe, just make sure she doesn't do anything that causes pain. Have fun! Great tips, I'm going to keep these in my little book of tricks. Maybe more so for me than the 15month old though - she's a little monkey. Clings on so hard with her core turned on that she's seated at 90 degrees! That's like the ultimate core strength move! We pay money to try to do stuff like that at the gym and they do it all day for free hanging off us and park equipment! Wow this is so important and something I would never have thought of. Its very sad that our kids are losing a strength that we are born and have evolved with. Thank you for the tips. Fortunately, if we just encourage them to play a lot, most of this can be avoided! I'm glad you found the tips useful. Oh I hadn't thought about core strength for the kids. Will have to test mine on the weekend. If you didn't answer 'yes' to any of the questions and if your kids are pretty active, they'll probably be okay :) But they do make fun games to play anyway - especially if you go first! !